I'll admit it. When I get really angry, I feel like breaking something. Picking up a big glass or dinner plate and smashing it against the wall would make me feel better. I know it would. I've just never done it, because frankly, I just don't want to pick up the pieces. But, designers Ronnie Yarisol and Katja Kublitz have come up with a wonderful solution! 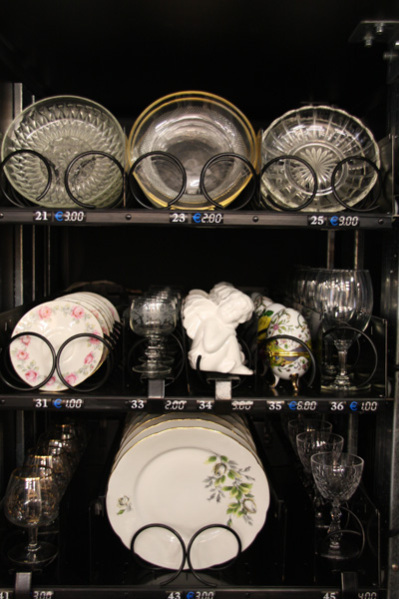 The glass and china vending machine, the design duo calls "Anger Release!" Here's a close-up photo of the Anger Release. The glassware and china look rather high-end. Perhaps Anger Release might double as a breakfront for your fine dinnerware. 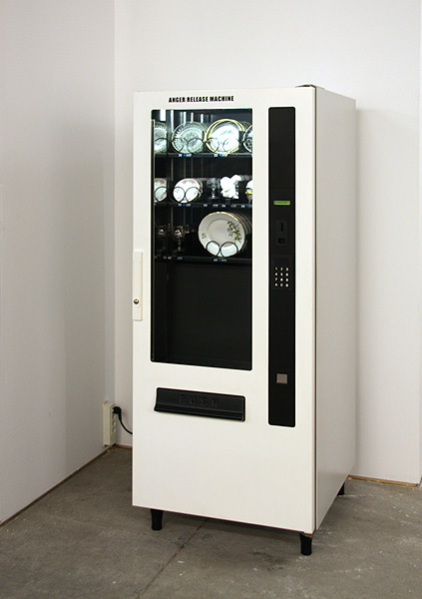 The Anger Release vending machine solves one big problem with anger management. It saves time cleaning up the mess you make. All the pieces break in one place. You can even cover the bottom of the machine with a liner for collecting all the pieces, especially those tiny slivers that become splinters in your bare feet, long after your anger has passed. But I would make the Anger Release quite a bit taller, so that the dish or glass I chose to break really made a BIG crashing sound. And I would probably synchronize my smashing arm with the drop of the dinnerware, so that it would feel like I was smashing it myself.